The heavy-duty # 11 Radius Bender will radius up to #11 (36mm) rebar. This machine will form a radius without pre-bending the bar and in most cases in a one-step operation. The KRB Radius Bender is designed to radius most rebar without the need to pre-bend the end of the bar. Keeping the operator's hands away from the forming rolls allows safe operation. The KRB #11 Radius Bender has been redesigned with a guard for making rings in a safe operation. The rings are guided over a top roller, allowing for continuous operation. The drive rollers do not rotate while the guard is open. A counter on the metering roll allows you to return to a previously selected position. A single count electronic controller is standard. KRB Radius control 2000 features memory locations for 32 radii for each bar size. For each bar size, enter the desired radius in actual feet and inches. 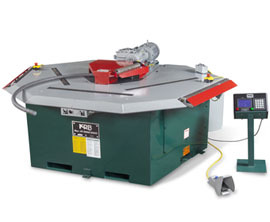 The KRB Radius Bender comes standard with a variable drive motor.